Thrive at the Red River College Library! “Thrive Week” represents a chance to take time to reflect on the role of self-care and balance on developing positive mental health that supports academic and career success. This year at Red River College, Thrive Week will take place from 5-9 November 2018. Events and activities provide an opportunity for rest, social connection, physical activity, fun, personal growth, and learning. All students, staff, and faculty members are invited to participate. 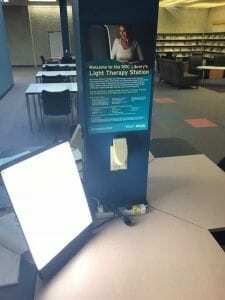 Therapy light located in the Notre Dame Campus library. This year at the Notre Dame Campus Library we will be hosting two “Thrive Week” events. At the front of the Library in the reading area we will be hosting a “Piece-ful Escape” where jigsaw puzzles and colouring books will be available for our patrons to exercise their mind and enjoy some quiet time. 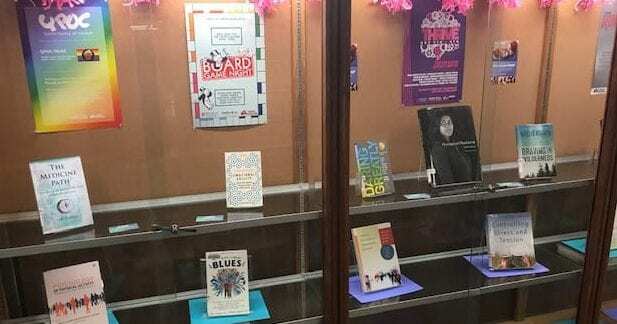 In the Recreational Book Exchange alcove we will be streaming “Wellness Themed” Ted Talks on Monday, Tuesday, and Wednesday from 11:00am – 1:00pm. With the oncoming winter approaching we have all noticed how short the daylight hours are becoming. The Library has recently placed therapy lights for patron use at both the Notre Dame and Exchange Campus libraries. Check it out! Check out the window display at Notre Dame campus. It features many of titles related to “Thrive Week” and the college’s “Healthy Minds Healthy College” initiative. Please check out our “Healthy Minds Healthy College” guide. It’s chock full of helpful resources! Red River College > Library > News > Events > Thrive at the Red River College Library!